The TV format is like the one used for “Extreme Makeover Home Edition” and in France it's called “D&Co – une semaine pour tout changer”. A team of decorators, builders, electricians and plumbers has a week to redesign - from scratch - the house of a family in a desperate state. 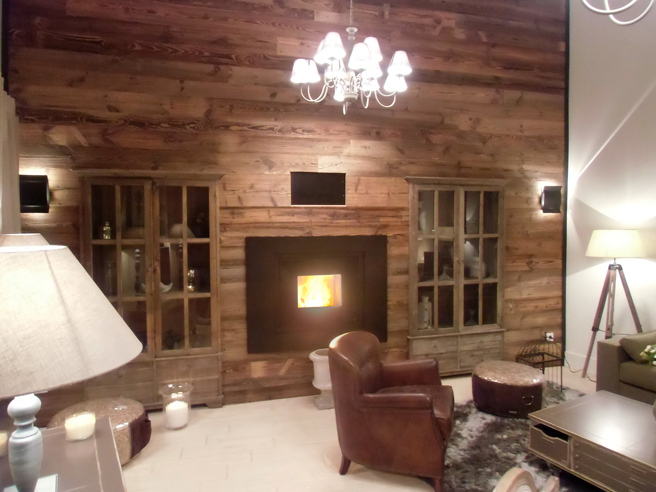 In the following project, a pellet fireplace, MCZ's Vivo 80 model, became the centrepiece of a new, ultra relaxing living area with a retro style and natural colours. Fifteen years ago, Bertrand and Marion fell in love with a large farmhouse in the countryside in the Île-de-France area in Orly sur Morin. After completing the most urgent works, Bertrand lost his job and was no longer able to carry the other planned projects forward. The couple, together with their four teenage children, ended up living in a very small portion of the house, while the rest of the space was completely abandoned. In D&Co's refurbishment project, the main objective was to redesign and make the most of the available space. The living area was rebuilt in two barns formerly unused. The first one became a studio for Marion's artwork, while the second one was turned into a large living room. To make it even more welcoming, a fireplace was installed on the main wall and a pellet model, MCZ's Vivo 80, was chosen to ensure maximum practicality. Indeed, the fireplace can be turned on and off with a remote control and can also be programmed so that, for instance, there's a welcoming fire when you get home. Moreover, Vivo 80 has an essential design and can be perfectly fitted into any kind of setting, acquiring a new look depending on the chosen cladding. In D&Co's project, the fireplace takes the limelight on a false wall specifically built to conceal the barn's stone wall, as it was impossible to use it. Fireplace and wooden cabinets were installed flush with a recess to ensure a perceived continuity of the wall. The works started with the creation and installation of the flue. As the existing one could no longer be used, a stainless steel flue specifically designed for this purpose with a double wall was installed. The fireplace was then positioned on a metal support. The pellet loading tank was installed at the front, directly on top of the fireplace. In was the only viable solution in this case, though it can also be installed on the side or at the back. Also the air vents were mounted at the front, next to the cabinets. This is the FLOAT model, which also serves as a luminous decoration, thereby giving the room an even more comfortable look. 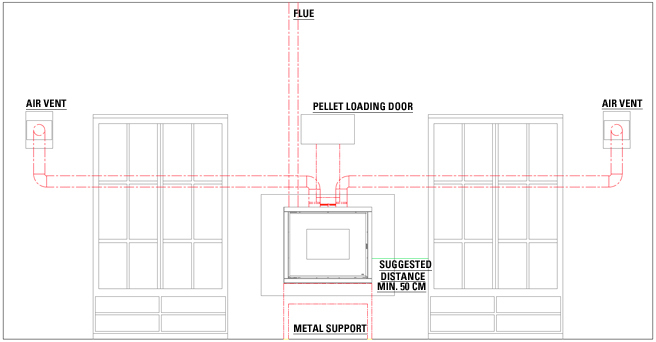 After installing the fireplace and positioning the cabinets at a suitable distance (see drawing), a fireproof plasterboard buffering was created across the whole wall. The fireplace was fitted with a standard cladding (FRAME), which was painted glossy black to make it as similar as possible to the colour of the frame and maintain a rather neutral shade compared with the colours chosen for the surrounding environment. The same colour was chosen for the pellet loading door. Finally, the plasterboard wall was entirely covered with brushed wooden boards with a "brulé" effect.